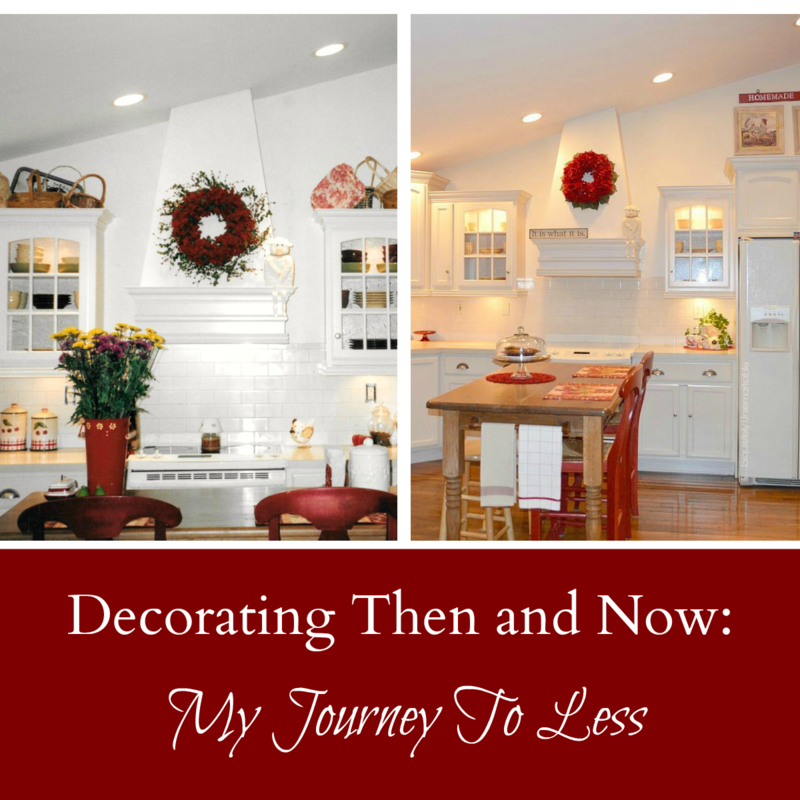 I have written before about how one decor item can change the entire look and feel of a room. Sometimes, it's a deliberate purchase. You are searching for the perfect accent and that one piece completes the look. Other times, a new addition causes a stir. You find something fabulous when window shopping, a total must have, but it doesn't exactly go with your existing decor or in my case, you receive a gift and it forces you to make a lot of kitchen decorating decisions. This beauty is the culprit. I have always had a covered cake plate on my kitchen table/ island...and not simply for show. I use it. I keep snacks on the table for the kids and their friends to munch on. Plus, my teens treat baking like a sport around here, apparently the intense dislike I have for cooking has skipped a generation, so I like to have a place to display their edible art, too. Well, long story short, I broke it. I have actually broken a few of them over the years. Apparently, it's not just soap dishes that suffer around here. Anyway, this one broke right before my birthday, fortuitous timing I guess, and hubby presented me with this this brand new gorgeous crystal one over the weekend. Now. It is very different from anything I probably would have picked out for myself. I am a decidedly simple girl who's going for a cottage style, farmhouse feel in the kitchen. Cut crystal doesn't really scream basic. ...but things have to change in the kitchen to make it fit. Well, according to me anyway. My husband thinks it's just my way of justifying a little redecorating. Ok, maybe, but either way, I decided to start with a window. Every time the seasons change, I swap out the valance over the sink. In fall and winter it's red, once the leaves start to bud, it's white lace. This spring I wanted a different lace, so I hit the fabric store and found something that caught my eye and some dainty trim. The trim was .69 a yard. No kidding! Here is where the decorating decisions come into play. 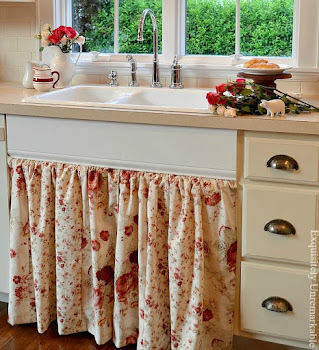 Do I want a straight valance? Or should it be swagged? Do I want a rod pocket or should I hang it on rings? Maybe I should add panels that drape down the side. I've never done that before! Or maybe I should go with no curtain at all. Well, I don't know. So, I loosely mock up several variations and leave them there for a day or two at a time to see how they feel. I'm trying on the sign above the window, too. It's clearly too small, but I like the rustic colors. I am making a change for sure, the old rooster sign has been up there for over a decade, but is this the right style and color combo for the space? Am I going to miss the red up there? Will I like words instead of pictures as a focal point? The only way to know is to try it out. Whether it's curtain choices or signage, I do not want to make the effort to construct something I am going to hate. I am a lazy crafter, I want to do these jobs once and then love them for a really long time ~ hopefully several seasons! I can't just keep the price tags on these lovelies until I decide if they fit, so I take these custom kitchen decorating decisions very, very seriously. I don't rush into them lightly, that is for sure. I take pictures, I live with my "maybes" for a few days and when I am pretty certain what I want, I start to craft. I'm already getting a decent idea of what feels right and I am hoping to dig into my projects this weekend. I'm not planning on making too many changes. I'm going to shake things up just enough to update this room for spring and craft a few fresh accents to make that fabulous crystal stand look a bit more at home. Exquisitely Unremarkable, if you will. In the meantime, I have treats! Who wants cake? Looking for more kitchen decor ideas? You have to make the beautiful cake stand work because your guy picked it for you. The end. :) I can't wait to see the little tweaks you make here and there. By the way, I've broken a few over the years too. What a beautiful gift! The lacey curtains fit very well I would say. Your hubby is a very thoughtful guy it sounds...and likes the treats too I bet! I'll take a big piece pkease, preferably chocolate or coconut or lemon. I'm not fussy ; ). I love the cake stand as is, but if you're in the mood to redecorate, it's as good a reason as any. I love the cake plate! I use mine in so many ways, not just for serving food. I often use it in a centerpiece or to display Christmas decorations. I have two. One was my grandmother's. It's small, clear cut glass with a bird pattern etched into the plate. I love it! The other I found at Salvation Army. I found the plate for $5 & a few aisle’s over I found the dome for $3!!!!. I was so excited. I don't know for sure if they actually go together. The base is etched glass & the dome is plain, smooth glass but the sizes fit & they look beautiful together. Wow, that sounds like a great find, Jenny! I have a few, since people have seen it on my table for years, they think I collect...which apparently I do now! ; ) I only have one with a dome though. I seem to break the domes. So I have a lot of bottoms which I also use for display and for desserts at holiday time. I think it works in your kitchen. Its elegance speaks for itself. I like to change things up. And like you, I typically do something and leave it a few days to see if it works for me. LOVE your new cake plate stand and the .69 trim is perfect! I can so relate to testing decor changes before committing ;) Can't wait to see what's next! What a beautiful gift from your hubby! I like how you are tying in lace curtains in your kitchen to go with the decor of the cake stand. I think the lace adds a beautiful softness to your kitchen. Thank you, Melanie. I really do like the look of lace, too. I just needed a lace change this year. I love the new pattern! Kim, your new cake plate is lovely. I am a big fan of cut glass and pressed glass. I don't know that I have ever seen one with a patterned dome. Just beautiful. You are very lucky to have a husband who puts forth that much effort into shopping and recognizes what your style is. Good job Kim's husband! I think your lace and trim is very pretty. I am not the best one to give curtain advice as most of my windows are naked. I would say tho, that if you decided that you needed a little bit of color on your curtain, you could add a little ribbon right above your trim,perhaps covering the solid part of your trim. You could probably even use fabric glue and glue it on. I like the sign above the window. I don't think that it is too small. I wonder if the scale would look different depending on if you choose a rod pocket or rings. Is your curtain rod attached or a tension one? 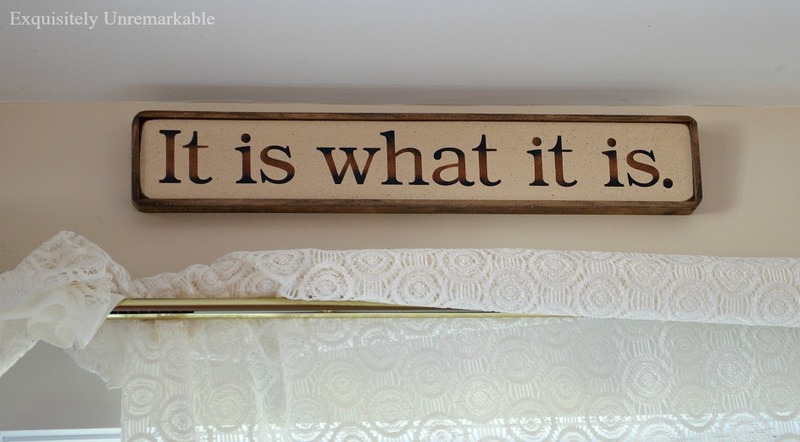 If it can be moved perhaps one of your trials could be to lower the rod to in front of your trim so that it does not stick up higher than your molding which might make your sign look a little more prominent. I know that it will be lovely whatever you decide. Can't wait to see what you come up with. He's a keeper, thanks Deb! Beautiful little cake stand, I have a few crystal pieces that I bring out during family get togethers, my way of adding glam to my very simplistic decor:) your kitchen is just so pretty, I love that you change things for the seasons! It really is a pretty piece and very different from my normal, everyday style. I am enjoying it! Cake plates are so awesome and this one is a great one. It is really special since your sweet guy picked it out for you. Makes that much more pretty. I like the lace curtains. Change ups are good. 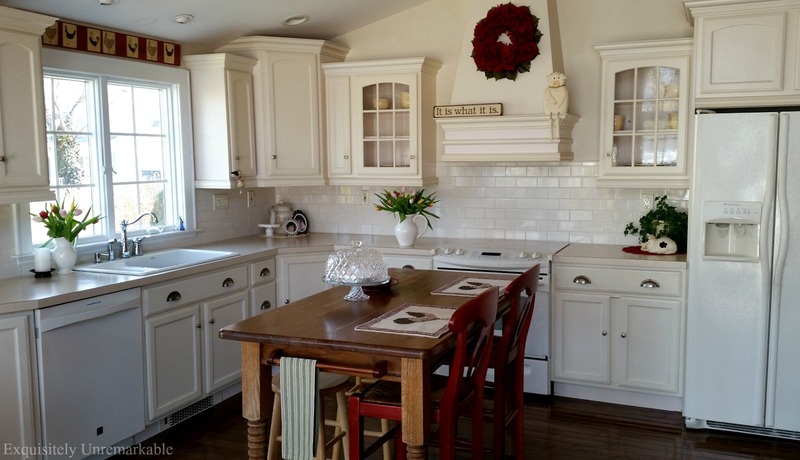 I cannot wait to get into my new kitchen and start to change it into a sweet cottage kitchen. Have a great week end. Ooooh me! I want cake!!! Lovely cake stand and so sweet of your hubby to pick it out all by his baby self! 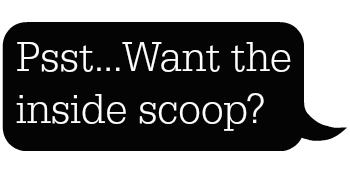 Can't wait to see the updates - no doubt they will be lovely....like you! I would love a piece of cake especially if it comes from your beautiful cake stand. 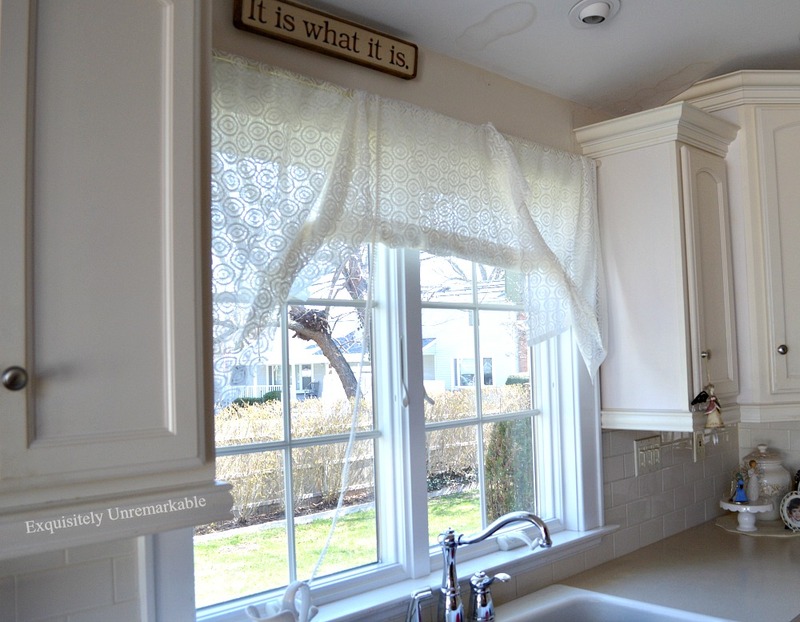 I have been looking for some window treatments for my kitchen so I can't wait to see what you do. The lace and trim you chose are really pretty! That is a beautiful cake stand.....such a sweet gift, Kim. I think hubbies sometime choose a gift for us because, consciously or unconsciously, they are hoping we will change things up or go in a different direction. I know it's true for my hubby. I think you will figure out something that works perfectly for you and your family. I know what I'd do, but I'm anxious to see what you come up with! Carol, what would you do?? I am feeling a bit stumped. Input is welcomed...I could use some inspiration!!! Oh I do so love the crystal-cut cake holder, it is a gorgeous beauty, and I know you will make it work! It is a treasured gift from your sweet husband for sure! It is always fun to change things up, and whatever you decide to do will be awesome! Beautiful crystal cake plate . . .
And I love the new lacy maybe not sure how/what look. Softens the kitchen into a clean, fresh, springtime updo! I love your beautiful kitchen! I love your pretty new cake plate and the curtains and sign. You have such a bright and cheerful kitchen. 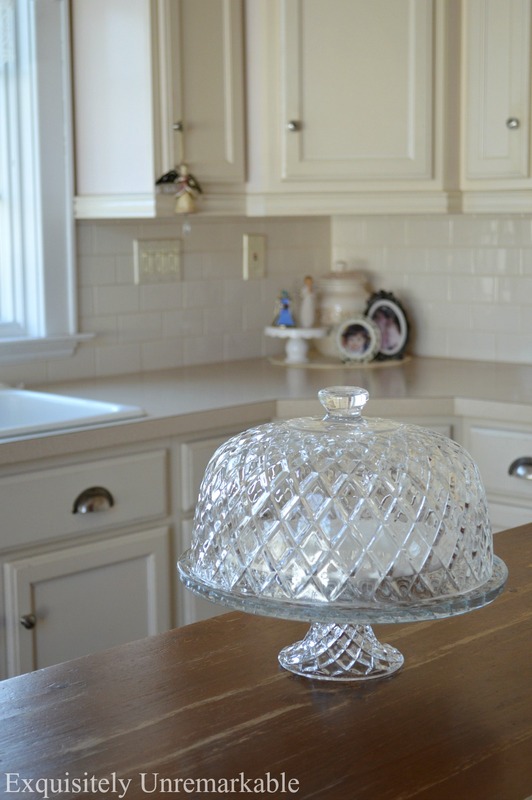 I love your new crystal cake plate! I think you're smart to live with changes for a few days until you decide exactly what you want. Can't wait to see what you come up with! well. you know me. I always love less. but I love your lace and crystal. it's a perfect counter balance with the warm wood. I agree, Tammy, I love them against my wooden table!! :) Thanks!! I love everything you wrote, Kim,---we are so much alike. I tend to dip my toes in the water before I jump in. I love that you use lace. It's something I used a lot in window treatment 10-15 years ago. I must admit...they are light and country~ish and romantic. Window treatments can and do change a room a lot! I love the thoughtful gift your husband gave you! Your kitchen looks so beautiful! Such a sweet hubby you have! Your kitchen is beautiful as is, so I know whatever you decide will be equally gorgeous. Some of my friends do like you - and live with an idea before actually deciding. I like to test the waters when it comes to design...unless it's a gift. Then I'm all in from the start!! Thanks for the visit, Jan! Kim I love your cake dish. I too have a baking teen in the house so I recently unearthed a dish like that and put it out after it had been hibernating for so many years in the cabinet. Looking forward to your spring changes and hoping all is alright with you. I like the idea to keep snacks in a cake dish. What a great idea, simply to make it look nice. :-)) I do not have a cake dish. I will have to put that on my list. I agree with your decision--to try out the lace and see, live with it awhile and then, let the look you are going for, whatever it may be, evolve. Hi Sandi! Oh I know how you feel, change is not easy and it's impossible for me to tell what things will look like until I see them come together in the actual space. I bet your new blue is beautiful! Enjoy your new master!! 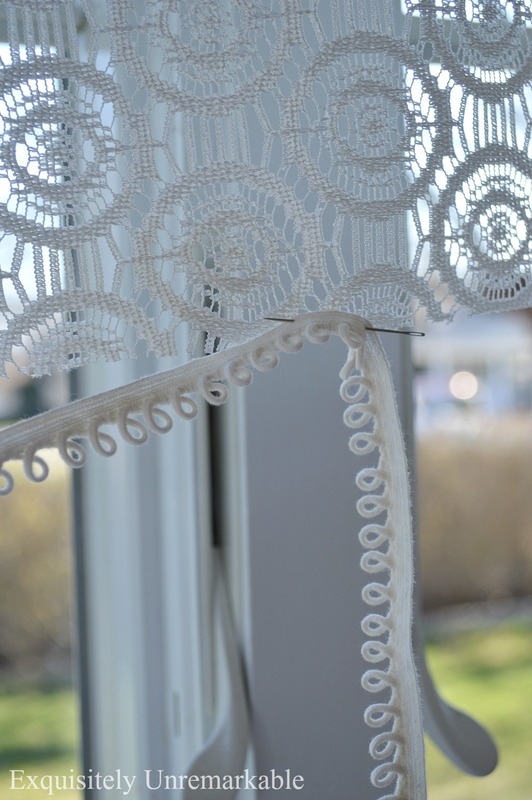 I love lace curtains in the spring/summer, they provide a sense of privacy while letting in all the gorgeous light. The cake is gorgeous and I can see the light flickering on the walls as it shines in. Lace curtains are my favorite Cathy...especially in the summer when a breeze hits them through an open window! Good morning Kim! So much beauty here and inspiration, truly. 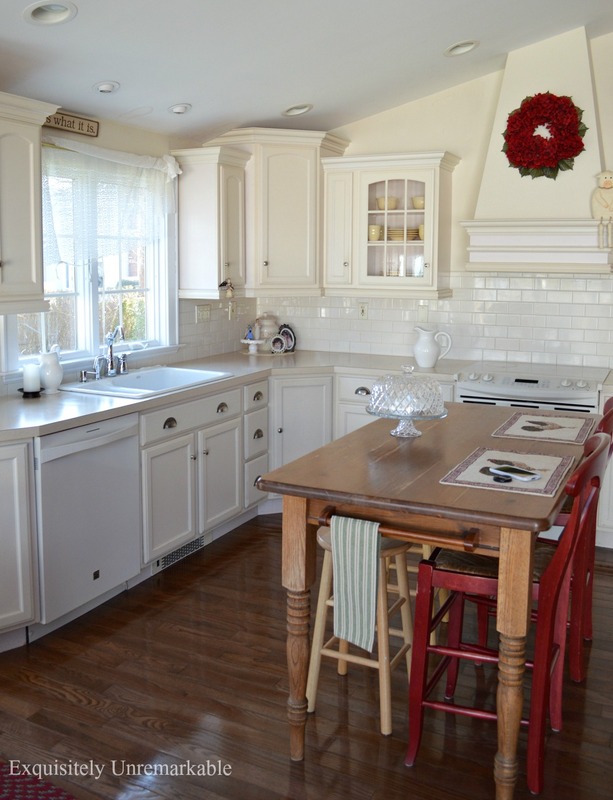 I am in the process of planning a major transformation in my kitchen with just paint and wainscotting. How fresh and gorgeous is your kitchen! I too enjoy having lace or even gauzy type fabric for curtains, the way the light filters through them or a soft Spring breeze feels so enchanting. You are so wise to tweak and think about it before actually cutting and committing to the project. I am going to remember this. I tend to get in rush and thats really not a good thing to do. Did you say cake? ;) Love your new cake stand. What a thoughtful hubby you have. Can't wait to see what you do with your kitchen. I know you will figure it out! I am trying out a new change on my kitchen window and as of yet I am still just experimenting. I find it helpful to do the same process that you are doing.